I have been suffering from body acne since 10 years. Please help. 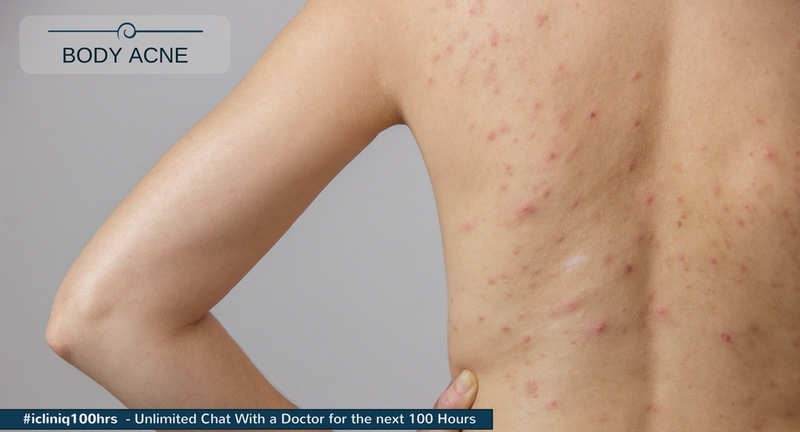 iCliniq › Ask a doctor online › Answers › Dermatology › Acne › I have been suffering from body acne since 10 years. Please help. Q. I have been suffering from body acne since 10 years. Please help. I have been suffering from body acne since 10 years. It is present on my upper arms, shoulders, back and buttocks. I have been using Benzoyl peroxide 5% since 6 months. But there has been no effect at all. • Which acne cream is causing dry, flaky skin around eyes and burns on cheek? Benzoyl peroxide alone is not going to work. Please send the photographs of the affected area to find out the grade of acne and to prescribe you the proper treatment. As per your instructions I have attached photographs. Apart from Benzoyl peroxide 5% (Benzac AC 5%), I have been using Soapex (Triclosan 0.5%) soap for bathing. I also take care to wear cotton vests and use anti dandruff shampoo regularly. I have been following this regimen for almost 6-8 months. I am 22 years of age. I was told that it will go away by the time I turn 21-22. But it is still present. My entire back till my upper thighs is covered by outbreaks. I also have it on my upper arms and shoulders. One more issue I am facing is that, there are scars left behind by acne, especially at the lower back. However, miraculously I do not have a single outbreak on my face. I have been patiently dealing with acne for nearly 10 years. I hope you will be able to mitigate this long suffered curse. I have gone through your photographs (attachments removed to protect patient identity). What you were told about acne is wrong, in most cases acne subsides by 24-27 years of age, and in few cases it can go even longer. Stop Triclosan as it is of no use in acne. Also stop using Benzac AC, I am giving you a good alternative. Microbenz 3.5 cream (Benzoyl peroxide microsphere gel), once daily in day time. Deriva CMS cream (Adapalene Microspheres + Clindamycin Phosphate gel), once daily at night time. Acne UV gel, twice daily on the sun exposed area. Tablet Acutret 20mg (Isotretinoin), one tablet daily at night. Use the Microbenz and Deriva after cleaning the lesion with cetaphil cleanser. It is normal to have dryness, cheilitis after using Acutret. So, you can apply any good moisturizer and lip balm of your choice. Do not apply any home remedy sort of things.